What Did Chinese Enterprises Bring to Africa? ETHIOPIA is one of the least-developed countries in the world, with a population of 100 million – 80 percent of which are farmers, and a GDP of less than US $800 per capita in 2017. 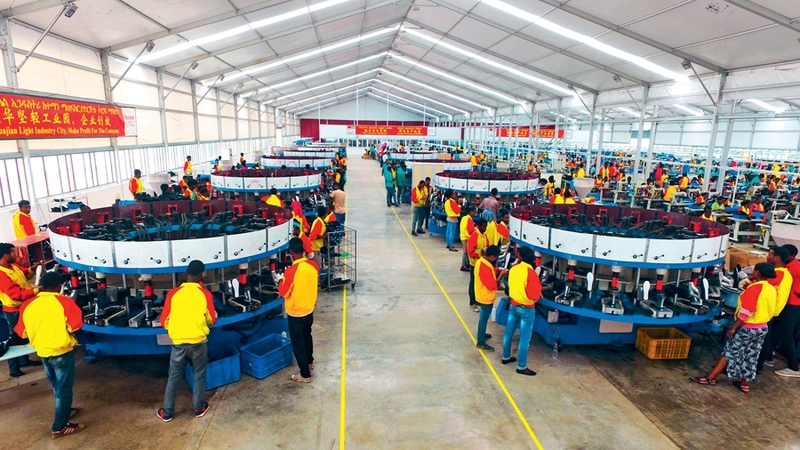 Situated 30 kilometers to Bole International Airport in Addis Ababa, the capital of the country, Huajian Group – a leading women’s footwear manufacturer – is in a burgeoning Oriental Industrial Park. Fluent in Mandarin, 26-year-old Frazier Genene has worked for Huajian Group for almost eight years. He was dispatched to its headquarters at Dongguan, Guangdong Province of China for training because of his good performance. Two years later, he returned to Ethiopia and was hired as a leader of the evaluation management department, in charge of over 1,300 workers. Frazier said he had a Chinese name “Guangzhou” given to him by his colleagues. Frazier Genene, team leader of the evaluation management department, checks the quality of shoes on the production line. 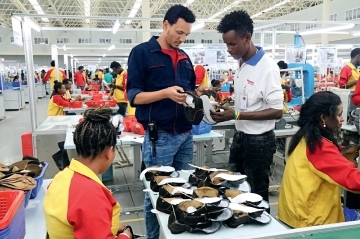 Twenty-eight-year-old Israel Etefa and another 88 local workers have also been trained at Dongguan in 2011 when the factory in Ethiopia had not yet started production. Seven years later, Israel has worked his way up to the position of director of the production line. His Chinese name is “Fazhan” meaning “development,” and Zhang Huarong – Chairman of Huajiang Group, gave him this name. At 6:30 every morning, hundreds of Ethiopian workers wearing T-shirt uniforms in green take buses from neighboring villages to the factory to have breakfast before work. After breadfast, some young men play basketball in front of the main building, while others play football nearby. At 7:40, everyone starts to work. Workers are on the production line carrying out tailoring, gluing, and the sewing processes of making shoes in the busy workshop. “We knew nothing about making shoes, neither could we speak Chinese at the beginning. However, in China, we learnt the skills to brush coating, paste the soles of shoes, tailoring, and all other needed techniques,” Frazier said. Established in 1996, Huajian Group is one of the biggest women’s footwear manufacturers in the world. Producing medium- and high-grade women’s shoes for many brands that are globally renowned, Huajian now has three business groups in Dongguan, Ganzhou of Jiangxi Province, and Ethiopia in Africa. Huajian started its investment in Ethiopia in October 2011, and the factory began production in January 2012, offering 4,000 jobs for local people. The company has exported US $80 million worth of products and has become the largest exporter in Ethiopia, praised by local society and media. “It is a win-win cooperation between Ethiopia and Huajian. As a labor-intensive manufacturer, Huajian needs access to a large quantity of low-cost labor and raw materials. Ethiopia is the second largest country in Africa with an unemployment rate of 50 percent, meanwhile the country abounds with high-quality leather; thus for Ethiopia, a company like Huajian is a good match,” Zhang Huarong explained. Huajian Group is indebted to the late Prime Minister Meles Zenawi, who recommended Huajian Group to build a factory in Ethiopia. In August 2011, he participated in the opening ceremony of International University Sports Federation in Shenzhen with the aim of inviting China’s labor-intensive manufacturers to his nation, giving full play to the low-cost advantage in Ethiopia, developing domestic light industry, as well as alleviating the unemployment. The well managed mechanized production line in the Huajian Light Industry City. Recommended by the world famous economist Justin Yifu Lin, the Prime Minister visited Huajian Group at Dongguan and investigated its shoe manufacturing lines for developed economies. Meles Zenawi then invited Huajian Group to do a field research in Ethiopia for investment, and one month later, Zhang Huarong flew to Ethiopia with his team and signed the agreement to build a factory there and put it into operation soon. Shoe manufacturing is totally new for Ethiopia. Though the labor cost is relatively low, the working efficiency is not comparable to that of trained Chinese labor, as most of finished products cannot reach the required standards. Huajian thereby has devoted a large amount of time and money to local workers’ training. The group built workshops and hired experienced Chinese workers to teach the local workers how to work on machines and by hand. Some workers with good performance were sent to the headquarters of Huajian Group at Dongguan or the technical training school of Huajian Group at Ganzhou to learn equipment operation, enterprise management, and Mandarin. On returning to Ethiopia, they were ready to be hired in management positions. 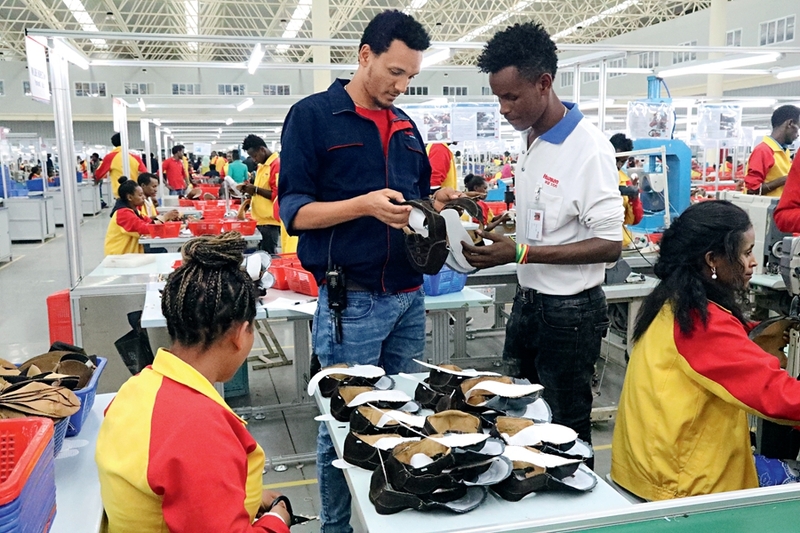 Since 2012, Huajian Group has hired over 4,000 employees, among whom over 3,800 are Ethiopians who are now competent for the whole process of shoe making, including leather cutting, gluing, and sewing, and can make up to 6,500 pairs of shoes a day. Huajian Group now owns six modern production lines and some raw materials storages, with an annual export of two million pairs of women’s shoes and a profit margin of 10 percent. Ethiopia is vigorously promoting labor-intensive, export-oriented processing industry. Huajian light industry park is now under construction, covering an area of over 130 hectares and possesses floor area of 1.6 million square meters. In the future, the park intends to attract investment from other processing enterprises in the fields of clothing, electronics, leathers and suitcases, transitioning from a processor and manufacturer for a single industry to multiple ones. With the burden of a large population, industrialization has gradually changed this African country. The former Prime Minister Hailemariam Dessalegn stressed that Ethiopia is now striving for industrial and economic transformation, aiming to become a manufacturing center of Africa. On the Boao Forum for Asia annual conference 2017, Justin Yifu Lin explained that the success of Huajian Group in Ethiopia has exerted a global influence. Nowadays, the annual foreign direct investment (FDI) to the manufacturing industry of Ethiopia ranks No.1 among African countries. More and more international buyers set up offices for business in Ethiopia. During the NPC and CPPCC meetings this year, Zhang Huarong as a member of the Chinese People’s Political Consultative Conference (CPPCC) was interviewed by China Today. He said that the Belt and Road Initiative and the idea of building a community with a shared future for mankind proposed by Xi Jinping, General Secretary of the Central Committee of the Communist Party of China, directed the future work for us. The Chinese entrepreneurs should take on their responsibilities to make the country prosperous and powerful.